WASHINGTON — President Barack Obama on Friday lifted U.S. economic sanctions on the former pariah state of Myanmar, the culmination of years of rapprochement that Obama has worked to facilitate. The Southeast Asian nation, also known as Burma, has pursued political reforms over the last five years following decades of oppressive military rule. The U.S. has already eased broad prohibitions on investment and trade but had retained more targeted restrictions on military-owned companies and officials and associates of the former ruling junta. U.S. companies and banks have remained leery of involvement in one of Asia’s last untapped markets. Friday’s executive order lifts those restrictions. 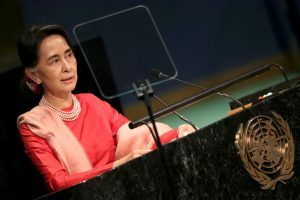 It removes the national emergency with respect to Myanmar — the executive order authorizing sanctions that has been renewed annually by U.S. presidents for two decades. It also lifts a ban on the importation of jadeite and rubies from Myanmar, and removes banking restrictions. “I have determined that the situation that gave rise to the national emergency with respect to Burma has been significantly altered by Burma’s substantial advances to promote democracy, including historic elections in November 2015,” Obama wrote in a letter to the leaders of Congress. He said the U.S. intends to use other means to support Myanmar in the “significant challenges” it still faces. Some Myanmar nationals will remain on the Treasury Department’s list of Specially Designated Nationals under other sanctions authorities, such as those intended to block the drug trade, a Treasury statement said. This bars them from any business dealings with the U.S. They include alleged drugs kingpin Wei Hsueh Kang and other figures from the United Wa State Army, one of Myanmar’s biggest ethnic armed groups. Among those taken off are ex-junta chief, Than Shwe, and the founder of one of the nation’s largest conglomerates, Stephen Law, whose late father was once described by Treasury as one of the world’s key heroin traffickers. Also taken off were military officials added to the blacklist since 2013 for alleged arms trading with North Korea, such as Lt. Gen. Thein Htay, chief of the Directorate of Defense Industries. Human rights groups have argued that lifting sanctions is premature as the U.S. will lose leverage over Myanmar’s powerful military. Despite the election victory by Suu Kyi party last year, the military still wields major political and economic influence. Sen. Ben Cardin, top-ranking Democrat on the Senate Foreign Relations Committee, voiced support for the sanctions action but concern over the plight of Rohingya Muslims, ethnic reconciliation and reform of a junta-era constitution that guarantees the military a quarter of parliamentary seats. “Even as we lift these sanctions we must maintain a focus on on-going concerns regarding the role of the military in Burma’s economy and politics,” Cardin said in a statement, noting that Suu Kyi had raised the issue when she met with senators during her Washington visit last month. Obama’s outreach to Myanmar has reflected his willingness to engage with American adversaries — others being Cuba and Iran. The administration has also sought to promote U.S. strategic interests in Asia. During its years of international isolation, Myanmar was heavily reliant on its northern neighbor China, which remains a key source of trade and investment.